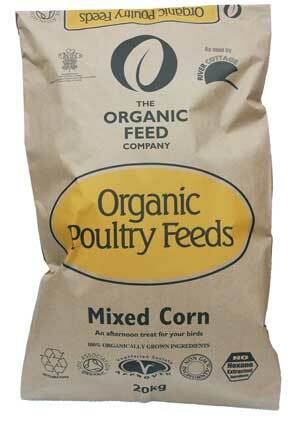 Organic mixed corn works well as a complimentary feed, when feed in conjunction with Organic Layers Pellets or Organic Layers Meal. The 85% organic wheat and 15% organic maze is ideally better scattered as a treat to encourage your hens to follow their natural instinct of scratching for their food. It will help keep them warm on a cold winters night. Care should be taken not to over feed as it can have a detrimental effect on egg production, so no more than 20g or an egg cup full per bird.